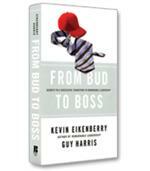 Written exclusively for Gen Y readers to address their unique needs, Becoming the Boss is a brisk, tech savvy success manual filled with real-world, actionable tips, from an expert they respect and relate to. Lindsey Pollak defines what leadership is and draws on original research, her own extensive experience, and interviews with newly minted Gen Y managers and entrepreneurs around the world to share the secrets of what makes them successful leaders. 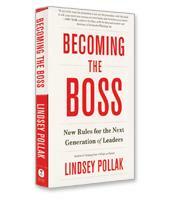 Lindsey Pollak, author of Becoming the Boss, is a Gen Xer (born between 1965 and 1982), and she will be the first to tell you that Gen Xers are not going to make a huge difference in the world. The reason: there just aren’t that many of them. After the massive boomer generation (born between 1946 and 1964), the next generation that will make a significant impact on the world is the equally massive Gen Y, or “millennial” generation (born between 1982 and 2000). Millennials are already stepping into leadership roles and will soon dominate the top ranks in government and business. Becoming the Boss is a manual for members of the millennial generation about to step into leadership positions, if they haven’t done so already. Pollak’s first piece of advice for these future leaders is to be the “CEO of You.” In two chapters (entitled “be” and “be.com”), Pollak describes how to build an offline and online personal brand, covering everything from handshakes to eliminating your online presence of any negative images. She also offers an in-depth step-by-step plan for building the most effective LinkedIn profile. ·Communication. Millennials must also know how to mix high-tech and “old school” communication methods — it’s still important to know how to carry on face-to-face conversations. ·Managing. Pollak writes that today’s managers have new challenges, such as dealing with a workforce that is more diverse than ever before. With command-and-control leadership no longer acceptable (or workable), today’s manager must also be more transparent and open with their employees and colleagues than in the past. ·Prioritizing. Given the multiple, 24/7 digital forms of communication, generation Y is the “busiest and most stressed out generation in history,” writes Pollak. Effective time and information management is key, and that means being able to prioritize and delegate as well as avoid losing too much energy on stress. One suggestion: cut down on trivial decisions by, for example, laying out your clothes the night before or having the same breakfast every weekday morning. It may not seem like much, but research shows such trivial decisions take a toll. ·Connecting. Pollak suggests that millennials looking to move up gather a “rotating advisory board” of about five different types of mentors: traditional mentors, who share their wisdom; co-mentors, who are traditional mentors who teach but also learn from the younger people they are mentoring; sponsors, that is, people who can actually offer you that promotion or work on your behalf; peers, who are in your shoes; and (a very generation-specific suggestion) Mom and/or Dad — as long as they stay in the background! Pollak is the author of Getting from College to Career, a book she was inspired to write as a result of her own experiences. In Becoming the Boss, Pollak, an independent consultant and speaker, again builds on her own experiences to lay out a thoughtful and comprehensive overview of the skills and attitudes any millennial will need if they ever have any hopes of becoming the boss.